In the eighteenth century, the Tuck branch of my family were living within the triangle in Norfolk formed by Cromer and Yarmouth on the coast and Norwich, inland. I begin with my greatx5 grandparents, John and Alice Tuck - although possibly one can trace Alice’s family back a few more generations, albeit with uncertainty. John and Alice settled initially at Worstead, a small parish six miles inland and south-west of Happisburgh. 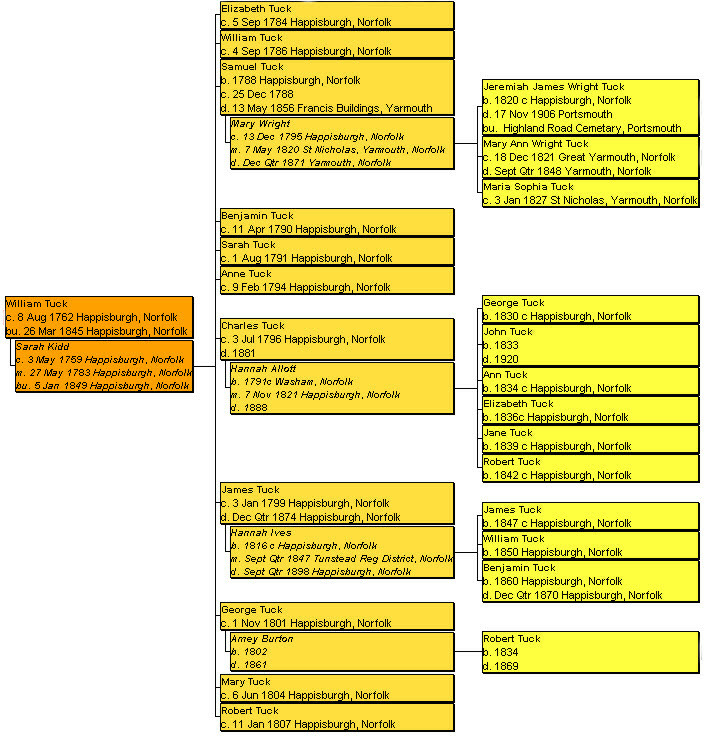 (Link: Happisburgh) However, Alice was apparently living at Happisburgh when she died in 1810 (see below) - possibly living with one of her children. Shown above are the baptismal entries for William and Sarah’s children, Samuel and Anne. Anne’s record notes that William was a ‘pauper’. Her sister Elizabeth’s baptismal record has the comment, ‘prio pauper’ or previously pauper. Clearly this provides an insight into the financial circumstances of the family in 1784 and 1794. However, there is more to this entry than meets the eye. In 1783, the Stamp Duties Act was passed whereby all baptism, marriage and burial entries in the Parish Registers were subject to a tax of 3d. The monies collected paid for the American War of Independence. There is a note on the copy of the Baptism Register for 1788 shown above that the duty was paid on the entries for that year. Paupers were exempt from this levy. The tax was unpopular and rescinded in 1794. Some clergy were sympathetic to the plight of the less well-off and ‘stretched a point’ when recording events so that families were spared the tax. Was this the case with the Happisburgh clerk? Probably not. In 1793, for example, there were twelve baptisms recorded but only three parents were noted as ‘paupers’. Of William and Sarah’s twelve children, two had the reference to pauperism inserted when they were baptised. If William was a fisherman at this time, perhaps this indicates the seasonal nature of a fisherman’s earnings. The huge shoals of herrings only passed nearby from September to December. Suffice to say, William and Sarah were poor. 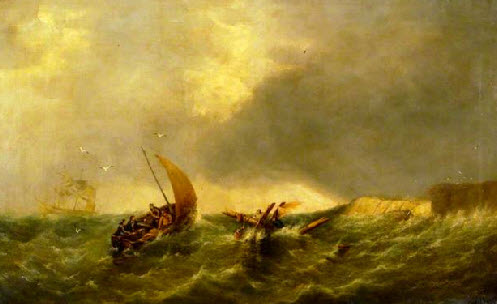 For example, in October 1814, the William was ‘totally lost on Happisburgh Sand; the crew were picked up by a fishing boat....the next day a laden collier struck upon the same sand which with immediate assistance and throwing some of the cargo over, was towed off towards Yarmouth’. Eight years later, the Sophia Magdalena struck on the sands. She was boarded by Happisburgh fishermen who ‘attended her for some days and brought away part of her cargo; but this was attended with the risk of their own lives and requiring great exertion the vessel sometimes being 12 or 14 miles from land.’ When a gentle sea breeze sprang up, two attending boats were able to tow and beach her. In 1826, the Thetford was blown ashore at Happisburgh and two local fishermen helped save the crew and a female passenger for which they were nominated for their ‘meritorious conduct’. There were compensations. In 1868, mammoth’s teeth, hitherto buried inland for millenia, were found in fisherman’s nets. And the twin-threat of vicious tides and gales both of which, in a moment, could cast vessels onto the sandbanks or the beach could also be a blessing. They provided the opportunity for salvage - and a reputation for heroism when the fishermen put to sea to rescue the crew of foundering ships. Indeed, the news from the area in the nineteenth century is dominated by accounts of shipwrecks, loss of life and acts of valour by Happisburgh fishermen. As well as the prolific herring catch, oyster beds were discovered off Happisburgh in 1820. However, fishing in the North Sea and danger are synonymous. The rip tides and unpredictable winds combine to create a most inhospitable working environment. Happisburgh together with its coastal neighbours conspired to form underwater hazards. Their cliffs fell regularly into the sea, creating off-shore sandbanks so dangerous that two lighthouses were built and became operational in 1791. They were augmented by a lightship in 1832. The following year, a large brig was seen on the sands with her hull under water. There was no sign of life, so the beachmen of Happisburgh went out to salvage what they could from the wreck. They found the crew hanging on the rigging but a high tide scuppered their rescue attempts. They made a few passes but were unable to pick up anyone and the ship broke up and its crew perished. 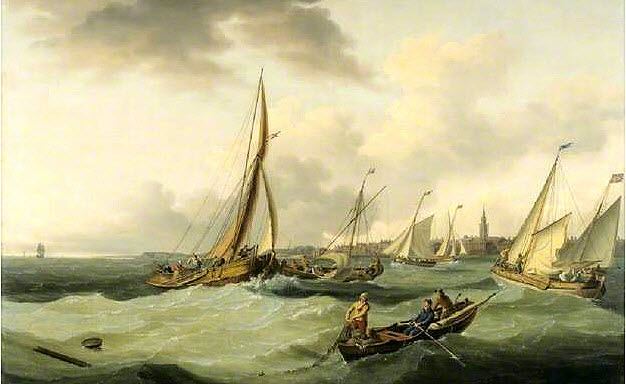 These examples from between 1814 and 1829 have been selected as they may well have involved the fisherman, William Tuck. In 1841, there were only four fisherman recorded in the census. They included William, now almost seventy, and three men aged from 25 to 30 years. Samuel Tuck was baptised on Christmas Day 1788. He married Mary Wright (Link: Wrights) at Great Yarmouth on 7 May 1820. Samuel marked the certificate, while Mary signed with an accomplished hand. Their marriage was announced in the Norfolk Chronicle. Samuel and Mary had three known children, though I suspect there are more waiting to be discovered. As befits a native of Happisburgh, some of Samuel’s occupations had a connection with the sea. In 1841, he was a shipwright (the first of several in my tree) and he was living with his family at High Street, Gorleston - a close neighbour of Great Yarmouth to the south, and in the county of Suffolk (see map below). When his son married, Samuel’s occupation was noted as sailor. He was in the merchant (not the royal) navy and there is a record of his maritime service at The National Archives: he was on board the Intrepid in October 1843 and June 1844. There is a news report concerning the lugger (a small working boat with a lug-sail) Intrepid at Yarmouth in 1849 which may or may identify the type of vessel on which Samuel served. 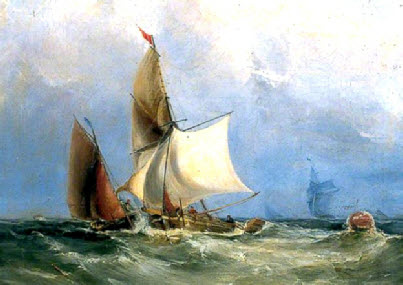 In April 1847, Samuel together with Robert Kirkby and John Hodge were found guilty of smuggling eight pounds of tobacco, seven pints of Holland gin and five pounds of tea on the cutter, Nancy (A single-masted, fore-and-aft-rigged sailing vessel with two or more head-sails and a mast ). He was fined 7s 6d and costs. 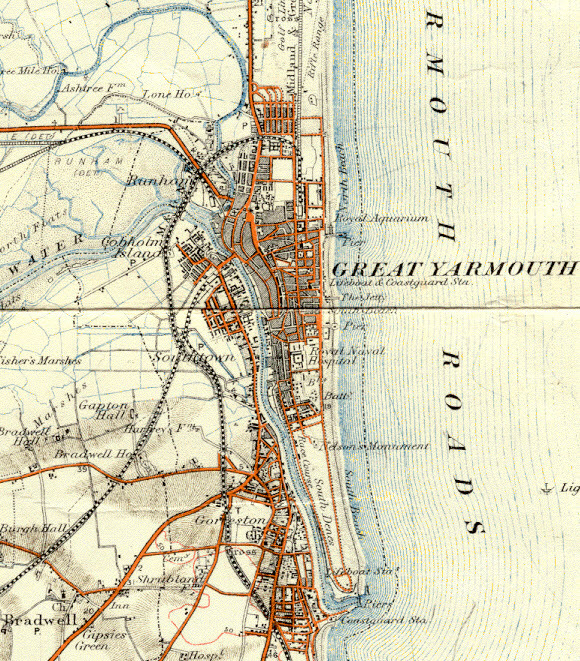 Perhaps this episode ended Samuel’s sea-going career as four years later, in 1851, he and Mary (a nurse) were living at Francis Buildings, North End in Great Yarmouth (see map below) and Samuel was working as a carter - an occupation defined later as a coal carrier. Also present in the household was the widower, William Bickers, (who had married the Tuck’s daughter, Mary Ann. She died in 1848) and their grandson, William Bickers jnr. Samuel (67) died at Francis Buildings on 13 May 1856 from ascites - the accumulation of fluid in the abdominal cavity. Eighty percent of ascites is the result of advanced liver disease or cirrhosis. In 1861, Mary was still at Francis Buildings with her brother, James Wright and grandson, William. Ten years later, she had moved to Wallers Buildings (see map below) at Great Yarmouth where she had her grandchildren, William and Ellen Tuck, for company. Mary died towards the end of that year, aged 75. When attempting to trace what became of William and Sarah’s children, several prove elusive. And there may be another to be added to the list - Charlotte Tuck, aged around 35, was living with them in 1841. Charles Tuck (born 1796) married Hannah Allot at Happisburgh on 7 November 1821. A witness to the marriage was his brother, Benjamin Tuck. The couple had at least six children as set out above. In 1841, Charles was living at Happisburgh and working as an agricultural labourer. He doesn’t feature in the 1861 census and died at Balcotha, Otago, New Zealand on 1 October 1881, aged 89. Robert Tuck (born 1807) appears fleetingly at 11 Thornton Street, Southwark, London where he was living on his own, a widower and a hairdresser. He died in early 1882. James Tuck (born 1799) was living alone at Happisburgh in 1841 but was a neighbour of James Wright (born 1783). In April 1837, there was a sale of two cottages and a shoemaker’s shop which were occupied by John Hemp, James Wright and James Tuck. The latter was working as a shoemaker in 1841. This may indicate a closeness between these families. 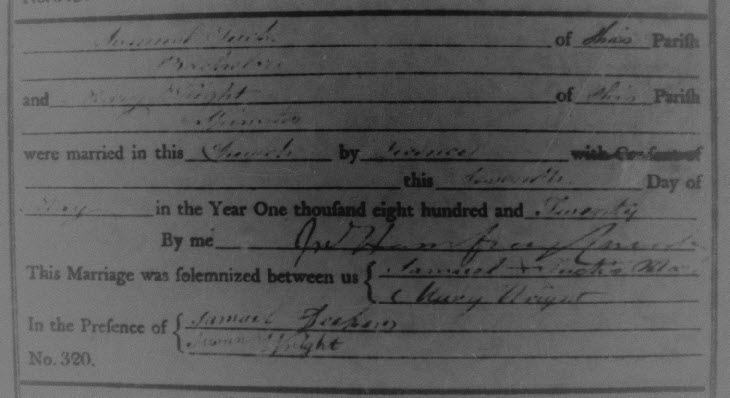 James (48) married Hannah Ives (31) in the summer of 1847 and was working as a fisherman in 1851. The couple had three known children and their son, William was also working as a fisherman in 1871. However, in 1861 and 1861, James was a farm labourer. James died towards the end of 1874. Hannah was a midwife at the Swan Inn, Wimpole Stree, Happisbirgh in 1881 and died in the summer of 1898.